After a long day hard at work, it was time to let down our hair and live it up Saigon style. The lights, the entertainment, the pollution? 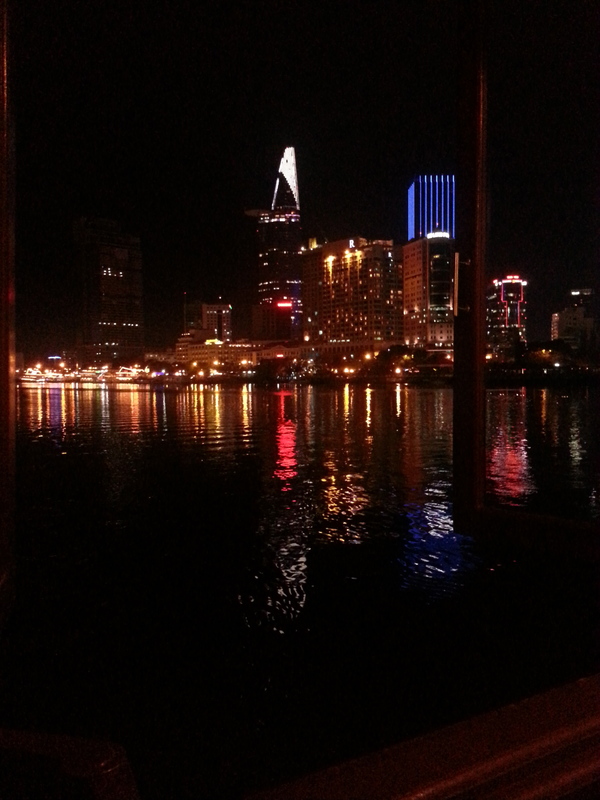 Saigon (the original name for Ho Chi Minh City) is a city of contrasts. Tacky neon lights advertising everything from tours to motorcycles for hire wink at passers by whilst modern white buildings coated in french inspired wrought iron glow luminescent in the darkness. Clean white buildings stand above the dirty grey streets and nest their upper floors in the sea of smog that surrounds the city. Our night began at our hotel, where we met our guide Tracey (Vietnamese name: Phuc), the hostess for the evening’s activities. First stop was the Golden Dragon water puppet show. 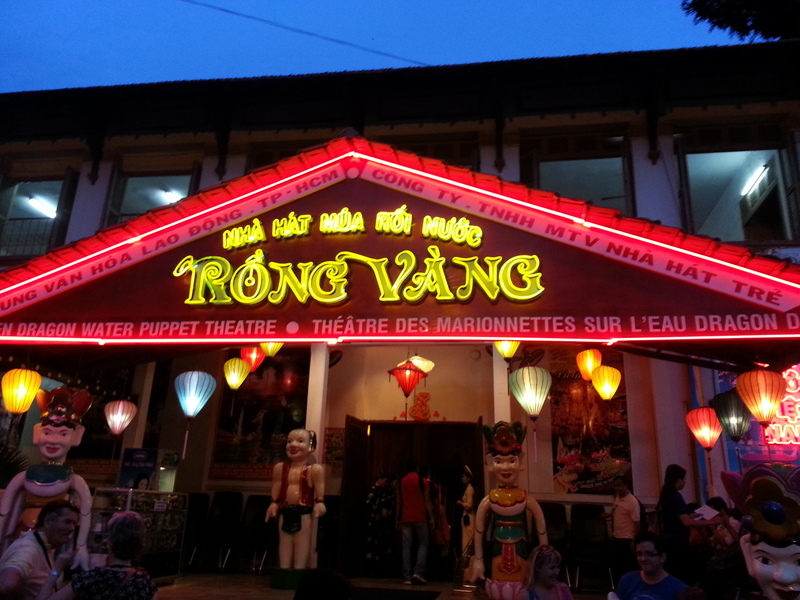 Originally from Hanoi, Water puppet shows are an integral part of Vietnamese culture, and have been used for centuries to entertain and pass on stories of the daily lives of the Vietnamese. The show is entirely in Vietnamese but it is easy to understand the basic plot. 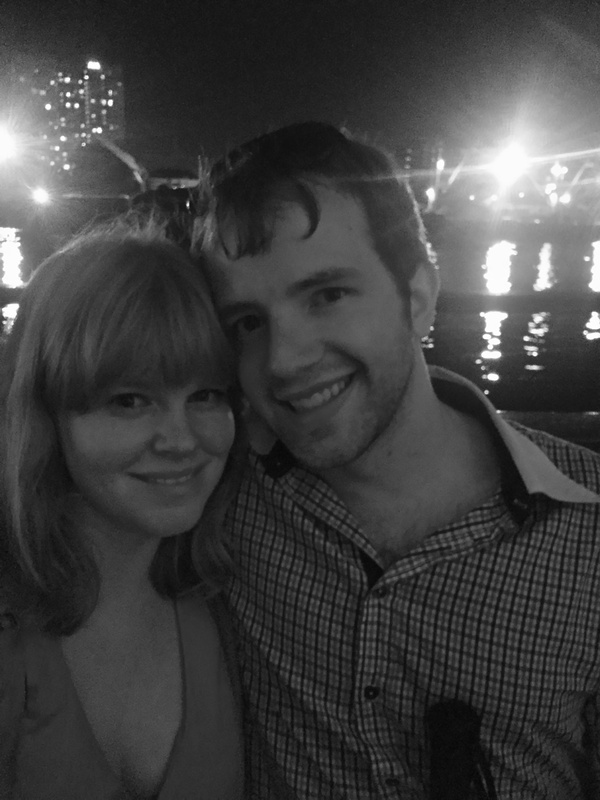 We sat enthralled, watching fish appear alive as they splashed through the water and seeing dragons shoot sparks out of their mouths. 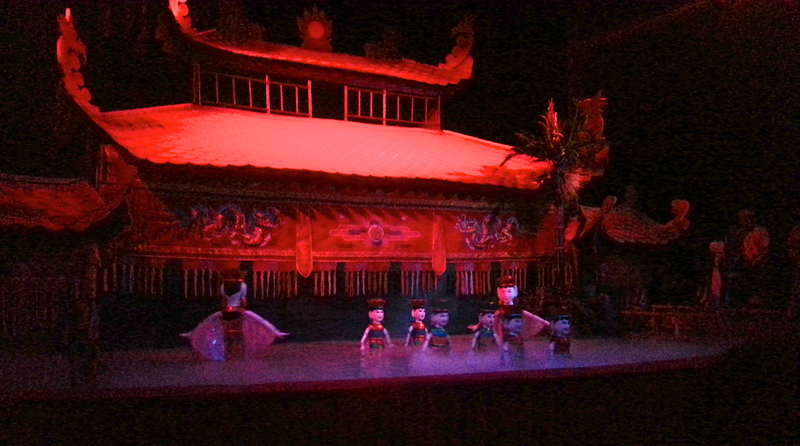 The wooden puppets dance across the water filled stage area as thought they are floating on air, controlled expertly by a single bamboo rod and puppeteer. One cannot help but be impressed by the complexity of the performance. Once the show had finished we were ushered outside to the waiting cyclos. 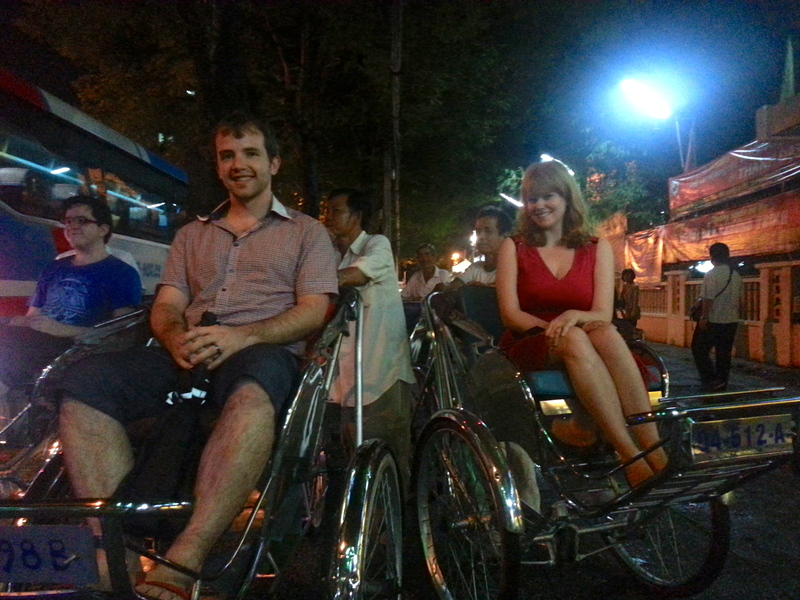 A cyclo is a form of bicycle taxi. The bike has a large seat on the front where you sit as the rider pedals the bike from behind. 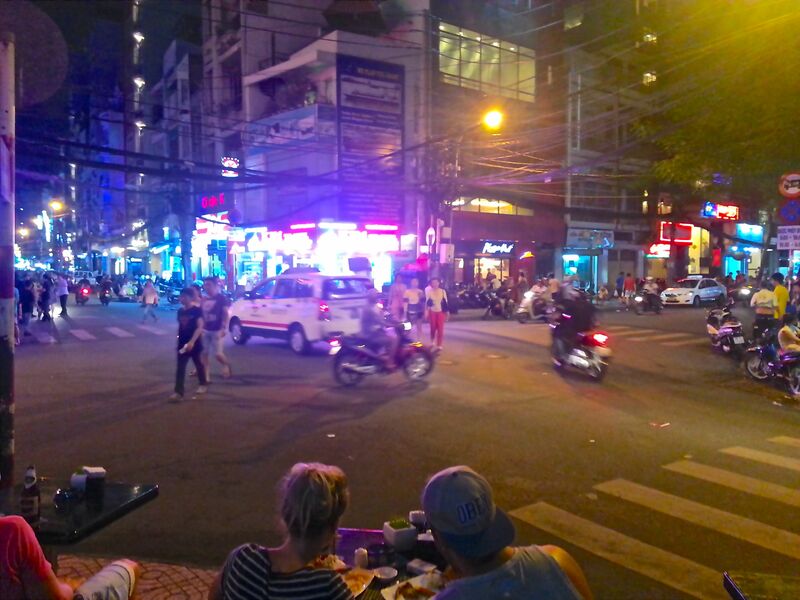 If you have ever witnessed traffic in Ho Chi Minh City, I think you would be dubious about entrusting your lives to a cyclo driver. But as you are whisked along by the lithe, skinny driver, you watch amazed as he aptly dodges pedestrians, cars, motorcycles whilst pointing out interesting sites. Or in Craig’s experience talking on his cell phone! It was an experience I know I will not forget. We arrived safely at our destination and I resisted the urge to kiss the ground. 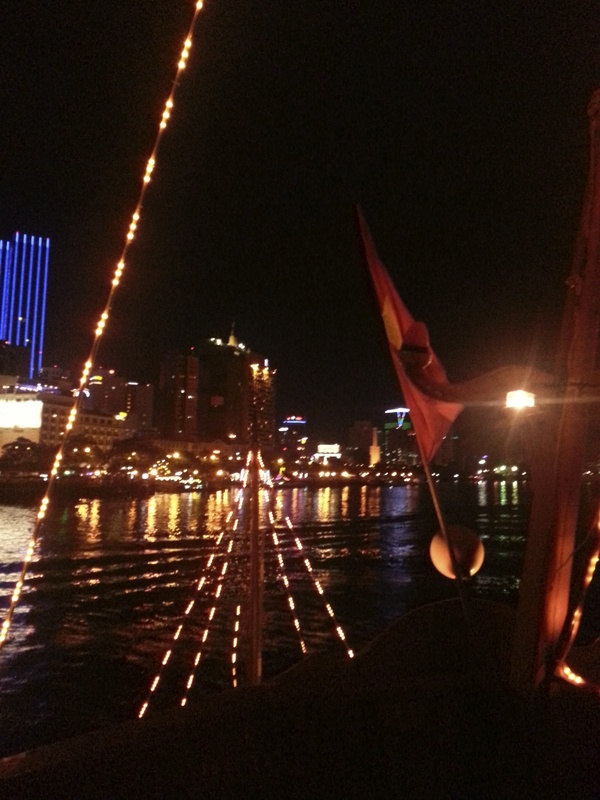 The harbour was lit up with several big junks and cruise ships decorated with fairy lights. It was a beautiful sight to behold. 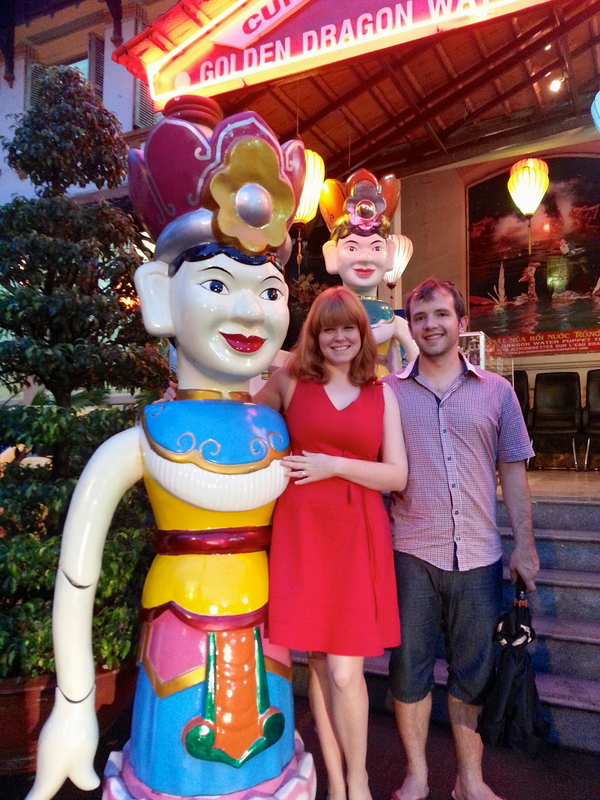 We had booked a dinner cruise on the Indochina Junk. We were ushered on board by white uniformed waitresses and led to a table near the back of the boat where we could enjoy the privacy of a partial wall away from the rest of the dining room. The boat cruise lasted for an hour and a half. Five or six different dishes were served for our gastronomic pleasure during this time; each providing a taste of traditional Vietnamese cooking and accompanied by the dulcet tones of the traditional band performance. As the boat inched it’s way along the river, the traffic, honking and pollution seemed to fade away. A nice change from the chaos of the cyclo ride. We returned to our hotel and farewelled our lovely guide. Tomorrow it’s on to the Cu Chi Tunnels, a big contrast from the fun and excitement of this evening.